Lets you view the contents of compressed archives. Is there a better alternative to BetterZip Quick Look Generator? Is BetterZip Quick Look Generator really the best app in File Management category? 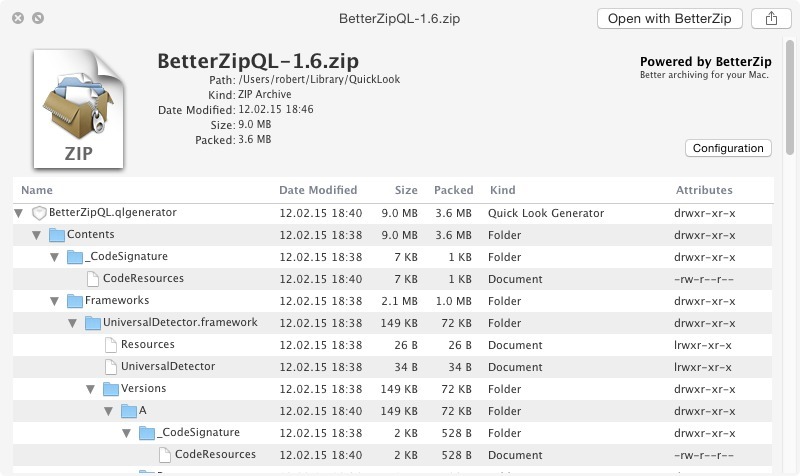 Will BetterZip Quick Look Generator work good on macOS 10.13.4? BetterZip Quick Look Generator lets you view the contents of compressed archives through OS X's Quick Look functions. Simply select an archive in the Finder, in Mail, or Spotlight and press the spacebar. You will immediately be presented with a neatly formatted table of the archive's contents that you can browse. The currently supported archive formats are: ZIP, RAR, 7-Zip, TAR, GZip, BZip2, ARJ, LZH, ISO, CHM, CAB, CPIO, DEB, RPM, SIT, DiskDoubler, BinHex, and MacBinary. Small layout tweaks and new unrar library. You can change various view options, set whether hidden files in the archive should be displayed or not, and whether you wish to look into file packages.